It’s often difficult to keep up with someone on a mobility scooter. 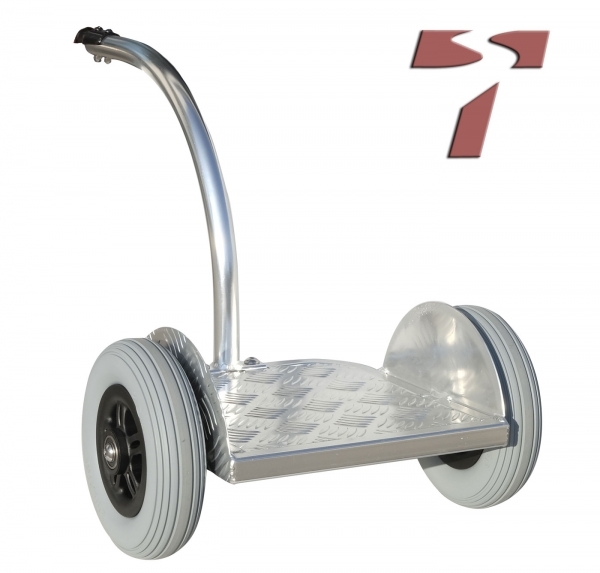 Our 5.5-lb standup trailer can be hitched up in seconds. The trailer can carry a maximum load of 220 lbs (passenger or luggage). The included hitch is designed to fit the TravelScoot, but can be fitted to other mobility aids. Due to the large variety of available scooters and wheelchairs, the customer is responsible for adaptation and installation of the hitch. Please note: Local and international restrictions may apply to the use of trailers, especially with regard to carrying passengers on streets. Observe all laws and regulations. Operate at reduced speed when towing the trailer, and do not operate in reverse. To prevent accidents, do not stand on the trailer when traveling over inclines/slopes and uneven ground. Related links to "Standing trailer"